The coastal region has become an increasingly popular recreation destination area. To meet the needs of both people and nature, the Partnership seeks to provide quality public recreational and educational opportunities that are compatible with natural resource protection and management. Working closely with communities and local volunteers, the Partner organizations promote and manage recreational activities. Partnership conserved lands typically allow for traditional uses such as fishing, wildlife and waterfowl hunting, and non-motorized recreational activities including hiking, cross-country skiing, snowshoeing, wildlife and bird watching, and canoeing and kayaking. Snowmobiling is permitted on designated state trails. Maps are available for downloading. Public access maps inform the public on allowable pedestrian non-motorized uses, locations that require landowner permission for certain activities, and designated parking areas. Separate hunting maps are available indicating conservation lands open for hunting, designated areas requiring landowner permission, and noted access areas for protected lands. The Partnership developed the four-mile Sweet Trail connecting 2,514 conserved acres in the Crommet Creek Conservation Area, in the towns of Durham and Newmarket. The trail integrates handicap accessibility, promotes appropriate public access and protects the integrity of the ecosystem. A detailed trail map and information brochure is available for downloading. For additional public access and funding information for other Partnership lands, see our Maps page. 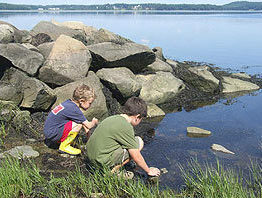 Programs sponsored by Partner organizations, such as the Great Bay National Estuarine Research Reserve’s Passport to the Bay, provide educational opportunities for citizens of all ages.